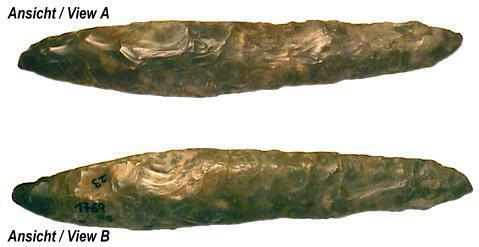 Late Neolithicum - Early Bronze Culture. Dagger, made of gray Silex. Handle area with natural Cortex and some "Zickzackgraten"
Cutting edges with fine prehistoric re-sharpening. Dagger No. 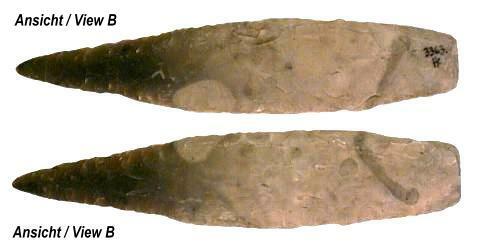 2.3363, TYPE "FLEHMER" -Knife, made of light gray-dark gray Silex, tip area slightly translucent. Late NEOLITHICUM. Dagger No. 3.1768, TYPE Ib/2, made of brownish Silex. NEOLITHIC. Dagger/Knife No. 4.1771, TYPE "FLEHMER"-Knife, made of gray Silex. NEOLITHIC. Rare! 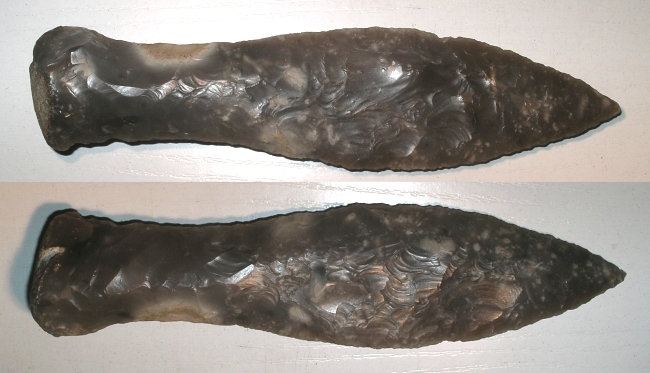 Stone dagger No.6.3364, Type VIa/3, made from light-to dark grey Silex. Late neolithic to bronze period. *Very short blade, handle end was used for fire beating, which was a common practice with dagger handles. Dagger No. 7.1770, TYPE III b/3, made of light gray-dark gray Silex. NEOLITHIC. Dagger/Knife made of gray silex, brownish patinated. Cutting edges with nice prehistoric re-sharpening. Handle area some use polish from prehistoric handle protection. Dagger preform No. 10.76, made of brown Silex. Late Neolithicum to older Bronze Period. 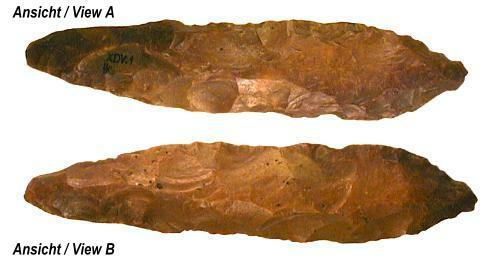 Beautiful stone knife, produced prehistorically from a broken leaf shaped dagger. 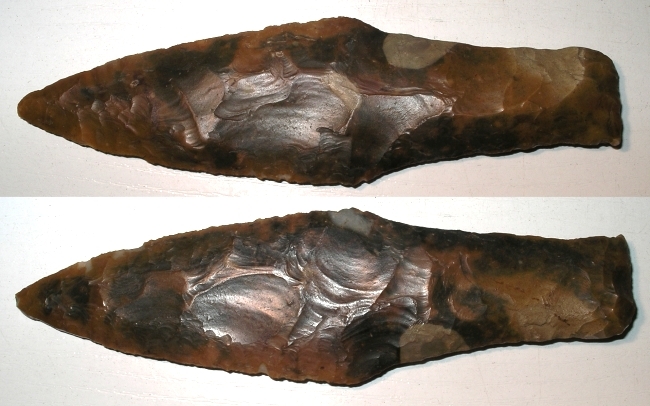 This artifact is complete in its way, it shows intensive prehistoric after-work as knife. Partly beautiful parallel flaking. Late Neolithicum to older Bronze Period. Dagger No. 13.1769, TYPE Ib/2 made of light gray-light brown Silex. Neolithic.